The African Nazarene University is part of the family of Nazarene institutions worldwide that are founded on the principle of developing students in a strong spiritual environment. The well-rounded, holistic education offered by this university helps students to establish themselves in the University’s core values – character, competence, and community. Apart from a wide range of secular courses offered, ANU also offers Christian-based courses like PhD Religion, Doctor of Ministry, Master of Arts in Religion, Bachelor of Theology and Bachelor of Christian Ministries. There are two scholarships available for deserving students, i.e. The Alumni Scholarship Fund (ANU-ASF) that is available for both undergraduate and postgraduate students. Students who are in their final year of study who demonstrate financial need, good academic standing and community service can apply for this scholarship. The Vice Chancellor’s Scholarship is given to high school graduates who perform well in their final exams (KCSE), with a KCSE grade of between A and B+. This scholarship amounts to a 50% reduction on tuition fees for an A grade, and a 30% reduction for a B+ grade. Scholarships are offered every trimester. KAG East University is a private university located in Nairobi, Kenya. It is owned by the Kenya Assemblies of God. KAG-EU is committed to excellence in equipping and educating students to become Spirit-empowered servants of God who are ready to influence the church and society. Programs offered by this university are tailored towards meeting present and future needs of the society based on Christian values. Undergraduate and Postgraduate (Masters and PhD) programs are available for interested students. Kenya Highlands University recently earned university status in 2011 after being a Bible college for over 50 years. This university is well known for its quality programs, and highly qualified and committed faculty. KHU is constantly seeking the opportunity to improve the scope and variety of programs and to prepare its students to become leaders who are capable of handling the challenges of today and tomorrow. Every interaction within this university offers students the richness of the Christian spirit and community that is part of the KHU heritage. KHU is located in Kericho, Kenya, and offers diploma, undergraduate, and master’s degrees. The financial policy of KHU is to keep the costs low enough to accommodate those students who would otherwise have to forgo a university education. About 65% of the university’s students receive some financial assistance in the form of work-study stipends, need-based assistance, and full/partial academic scholarships. Moffat Bible College was founded by the Africa Inland Mission and is based at the headquarters in Kijabe, Kenya. 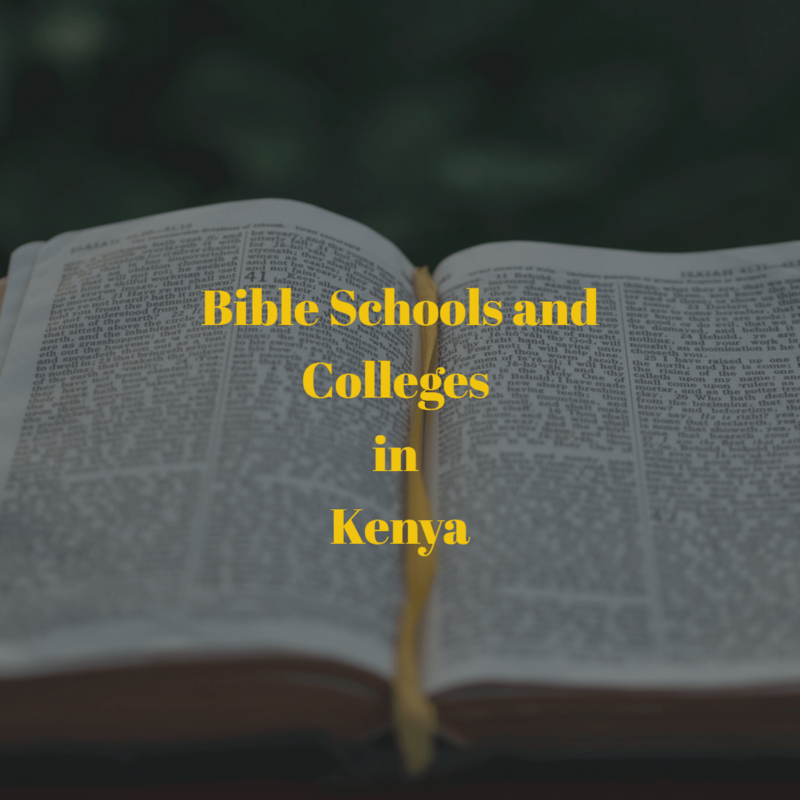 This college, part of the Africa Inland Church, was created for the purpose of training evangelists and pastors for the growing church in Kenya, while also publishing Bible courses and Christian materials. This Bible College welcomes students from other denominations other than the Africa Inland Church. Moffat offers a three-year Diploma and a one-year Higher Diploma in Bible and Theology in the following subjects: AIDS Ministries, Bible and Theology, Counseling and Chaplaincy, Inter-Cultural Studies, Christian Education and Pastoral Ministries. There are scholarships available for second year, third year and higher diploma students. These scholarships are awarded based on financial need and general worthiness of the applicant. The Africa International University (AIU), originally known as Nairobi Evangelical Graduate School of Theology (NEGST), was founded in 1983. It is located in Karen, Nairobi. This university received its charter from the Kenyan government in 2011 and has since then committed to training Christ centered leaders on being agents of transformation for the community, country, and society. AIU participates in God’s mission to the world by integrating a Christ-centered worldview in knowledge and research and enhancing its relevance to the mission of God and the needs of Africa. Diploma, undergraduate, and postgraduate (masters and doctoral) courses are available to prospective students. International Leadership University (ILU), formerly known as Nairobi International School of Theology, is located in Hurlingham, Nairobi. This institution aims to equip and develop transformational leaders for Africa and the world. ILU is committed to becoming an excellent university that advances biblical values through transformational leadership and academic excellence. This institution offers courses at all levels – certificate, diploma, undergraduate and graduate levels. Every student gets to learn in an environment in which the core values of dependence on God, passion for excellence, passion for the Great Commission, moral integrity and contextual relevance are instilled. Pan African School of Theology (PAST) is a private, inter-denominational, residential and day college located in Nyahururu, Central Kenya. It facilitates accredited university-level programs in theology-related fields. This college was founded in 2006 by PACE Ministries International and given the mandate to provide higher education for a new generation of Christian leaders. The founders’ vision called for a new school that would nurture students to be Biblical scholars, peacemakers, evangelists, leaders, and spokespersons. They were to be creative thinkers and passionate men-of-action, above reproach, equipped to shepherd the Church and redeem all things to the glory of God. PACE Ministries saw the need to make theological education accessible to Kenyans while giving them a platform for scholarly dialogue over Pan-African issues in theology from a Biblical perspective. Scott Theological University (formerly known as Scott Theological College), was established in 1962 in Machakos, Kenya. As the national theological college for the Africa Inland Church (AIC), this college was tasked with providing training for church ministries at an advanced level. SCU is currently a dynamic centre of excellence in learning, teaching, research and holistic service, all intended for the glory of God. Providing quality programs of education and training, inculcating godly character for holistic transformation of individuals and society, promoting research and preserving and transforming knowledge and skilled services are the key values that SCU intends to instill in its students. The School of Theology currently offers certificate, diploma, undergraduate and graduate courses to prospective students. St Paul’s University is a partnership between four participating churches, i.e. Anglican Church of Kenya (ACK), Presbyterian Church of East Africa (PCEA), Methodist Church of Kenya (MCK) and Reformed Church of East Africa (RCEA), and the National Council of Churches of Kenya (NCCK). St Paul’s University is located in Limuru, an area whose serene surrounding is ideal for study. The University prides itself on being a centre of academic excellence, where servant leaders are developed through the impartation of knowledge, skills, and values through Christian spiritual formation and creative educational methods. The School of Theology, which boasts some of the most distinguished scholars in the region, offers certificate, diploma, undergraduate and postgraduate courses. Every year, scholarships are awarded to academically deserving and needy students. The criteria for receiving an SPU scholarship include leadership skills, commitment to the university’s vision and mission, financial need and overall academic progress. Word Ablaze Ministries is located in Nakuru, right in the heart of the Rift Valley. Paul and Donna Tocco founded the Word Ablaze Bible Institute, which targets students from all over East Africa. The Bible Institute targets pastors and leaders who have ministry experience but lack theological training. Most students who study with Word Ablaze Bible Institute are already pastors or leaders ordained within their own denominations. While at the Bible Institute, students are encouraged to come seeking to learn, grow and be renewed in Christ. In turn, the facilitators of the program will teach the pastors the Word of God with the intention of filling the gap in theological training. On completion of the course, students qualify with a Diploma and receive a certificate of achievement. Kenya is a wonderful country know for its safari adventures. Our country and continent has been evangelized. Our endeavor is to reach the evangelized and educate those who excepted Jesus Christ. We must teach them the Word of God, develop their faith and train leaders in the five-fold ministry. Our commitment to the vision has spawned unprecedented growth. In 2006, Ngaho Ministries International (NMI) established two more locations in Durban, South Africa and Kigali, Rwanda. In each location, our student population is growing along with the need for more faculty. I need to do distance programme in theology which college is offering that?